I have suffered from Migraine Headaches my entire life. The medications needed for relief from the severe pain oftentimes left me feeling groggy and wiped out, unable to do many daily activities as well as other activities I enjoy. I have tried a great number of medical treatments available over the years, in an attempt to prevent or at least lessen the number of Migraine Headaches I experience. During the time I have been receiving Chiropractic care through your office, the number of Headaches as well as severe Migraine Headaches I have experienced has decreased significantly. Consequently the need for the use of over powering pain medication has been reduced, allowing me to live and function more freely from pain as well as the associated side effects of the medications. Quality of life has always been very important to me, with an emphasis on living as opposed to merely existing. I recognize the positive effects Chiropractic care has on my health and therefore, my life. I now consider it to be a necessary part of my overall medical care. When I started to feel 65 instead of 35 I knew I needed to get help. (I'm really 58) I was at the Farmer's market and Eureka!! I found her, Dr. Eva Chiu. I've been praying to find a great doctor to check me out and Dr. Eva was God sent. . In 1980 when I gained control of my life I was a useless body barely making it. I found a chiropractor in Oceanside, CA and with 16yrs of his care and I gone from useless to being able to work 3 jobs, run a 10K every month and 5 days of jazzercise. I lost 30 pounds and I gained a new found ME. Finding another doctor to give me as much care has not been easy. For 10 years I've been to several chiropractors who I thought to be the best. They helped. But just recently I started to think that the way I was feeling was just a new phase of approaching 60. I was wrong. Like I said, there was a click with Dr. Eva. After my first adjustment right away I knew that this is what my body was used to. Palmer trained Chiropractors. Wow, within ½ hour, I felt way better. My back is a wreck; my X-Rays were described as a wreck. , so I'm on Dr. Eva's plan for helping me to fix the wreck into a functioning spine so all of me works better. I even get my hands adjusted! I can now crochet a blanket for my granddaughter. My health depends on me and I choose preventative health through Chiropractic. So if Chiropractic can't fix me, then I'll go to medical doctors. It is now my 14th adjustment and I'm feeling so much better. I'm almost 33 now. Before I started receiving treatments for my back, I was in great discomfort and pain for many, many years. As a result of your excellent treatment plan, and your outstanding professionalism, I must say that I am feeling a thousand percent better than ever. I do appreciate your expertise and your wonderful personality. It was been a privilege as well as a blessing to be one of your patients. The extra added bonus, of your Christian beliefs and philosophy has made me feel that is was in God's divine plan to bring me to your office and be a recipient of your outstanding service. Thank you, thank you for giving me hope in an otherwise hopeless situation. I now feel that I no longer have to be a slave to the misery and discomfort of a progressively degenerative back condition. The staff at Awender offices are also to be commended, for everyone there has made me feel welcome and a part of the Awender "family". May the Lord continue to bless you and the staff in your endeavors, lift you up in His spirit, and give you peace. 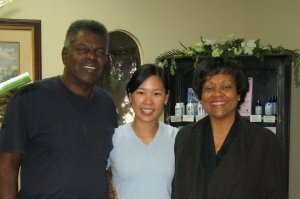 Three years ago following a sleepless night due to a back injury earlier that summer, Dr. Eva Chiu's office called my home. I had just fallen asleep and when offered a free health consultation, I accepted simply to get off the phone and return to sleep. When I awoke, I realized what I had done. I didn't know anything about chiropractors or their practice. What kind of education do they have? Are there good ones and bad ones? Since I had an injury already, could they harm me more? Resolved to find out more or cancel my appointment, I consulted the Better Business Bureau, the American Chiropractic Association, my friends and family. I even drove by the office earlier in the day. Satisfied that I would not end up with more damage, that these doctors had degrees in their practice, and while there were good ones and bad one, the Clinic was reported to be a good one, I went to my appointment. After a genuinely thorough examination including x-rays, Dr. Eva Chiu took over my care. She offered me an opportunity to relieve the lower back pain caused by the injury, the upper back pain that caused me fatigue in almost every activity, and the upper neck pain that caused me migraines, for which I was taking medication twice a day and still suffering from one or two migraines a week. Deciding it was too good to be true, but couldn't hurt, Dr. Eva and I embarked on an ambitious health care plan. Three times a week I was adjusted and every day I stretched and did strength exercises. After six months I had stopped taking migraine medication and had no more migraines, I was stronger and able to work in my garden for more than fifteen minutes at a time, and I was taller! My care has changed over the years, as I have improved I have needed fewer adjustments and the adjustments I do need are easier done. I still have structural issues that even Dr. Eva cannot cure - one leg is shorter than the other, etc. But I have very little and very rare pain in my upper neck, no more migraines, and today I am going to work in my garden for as long as I want, no pain to stop me. I was a skeptic of the highest order and reluctant to accept alternative care. But I can say honestly that my life has higher quality due to the care that Dr. Eva has given me. I am infinitely grateful. Why live with pain? I was for a long time before I finally found Dr. Eva in Redwood City near where I work. The place is very easy to get to with easy parking. Everybody is very friendly and helpful, and the facilities are clean and professional. 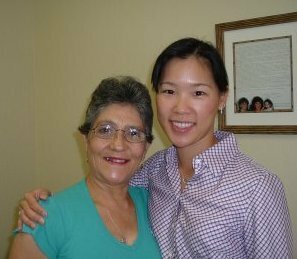 Not only will Dr. Eva's friendliness and positive attitude put you at ease, she is also very knowledgeable and will explain the problem and the treatment in a way that makes sense. Her technique is excellent and even though I have a relatively large frame, she has no problems adjusting my spine in various ways. Three weeks into the treatment and I am now almost pain free in my lower back (the reason I went.) I have also received effective treatment for two injuries I thought were untreatable (an "arthritic" shoulder and an old knee injury) and had resigned myself to living with.